Automation Killed The PPC Star | Clicteq | PPC Agency London, Humans, I don't see any? Delloitte has predicted that 35% of current jobs are likely to be automated in the near future, with professional services being highlighted as an area with a high chance of automation. So what does that mean for PPC managers? With automation using Adwords Scripts and the API becoming more accessible and more sophisticated, it is likely that over the next 5-10 years there’s going to be a lot of disruption. If you, for example, take a look at the bulk of the tasks that a PPC manager does daily, such as adding negative keywords, tweaking bids, setting bid modifiers, testing ads, copying Adwords into Bing, reporting and playing table tennis in shorts in a fancy office; they all require very little higher cognitive function. In fact, most of these jobs are much more suited to machines than humans. If you think about it, it doesn’t make much sense to have somebody download a report into Excel, calculate the bid modifiers using a formula, and then manually enter them into Adwords. When using a basic script you can do all 3 tasks instantly across thousands of campaigns. 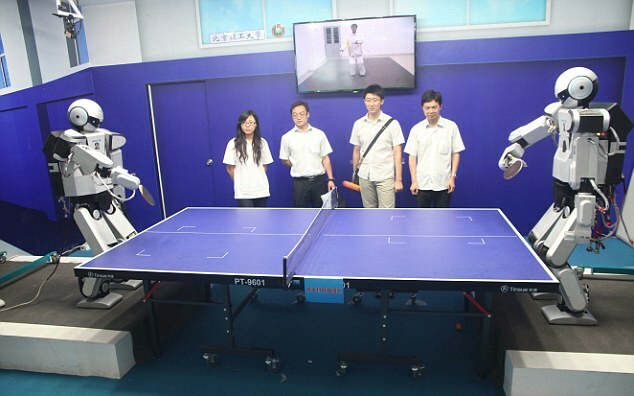 And sadly you can even automate table tennis! This is what we expect the PPC agency office of the future to look like. But on a more serious note, automation provides a much better outcome for the client. The average agency optimises anything from once per day to once per week, but a script can change bids around the clock in real time, 365 days a year. Sure, there are critics that argue that automation might make changes that humans wouldn’t which could be detrimental. A programme on the API is only as good as its writer – it needs to be written with the correct fail-safes in place. Automation should not only be as effective as humans, but should be more reliable and make fewer errors. So is my PPC job doomed? But the PPC manager of the future is going to have to adapt to fit one of two roles, based on my experience at Clicteq. The first role will concern the creation of exciting new technology on the API, using Adwords scripts to automate manual repetitive tasks. We expect this to replace the PPC executive role completely within the next 10 years, and a large chunk of the work that PPC account managers and directors do. We expect to see agencies investing heavily in their own technology, and expect an increasing number of agencies building their own in-house technology teams. The second role we envisage is that of a strategic advisor. Based on what we are currently doing at Clicteq, we expect them to advise on competitive strategy, reporting to stakeholders, and determining the best bidding, testing and account strategy to meet the client’s objectives. If the future progresses in the manner in which we expect, we believe that it will be a bright one for today’s PPC managers. Gone will be the days of boring repetitive manual work, which will be replaced with much more meaningful, strategic, client-facing work. For the more techie PPC managers that opt to develop coding and programming skills, you will effectively be able to build new features into Adwords and automate the vast majority of PPC tasks. Instead of being replaced by technology and jobs being lost, PPC managers are likely to be displaced into new roles which we believe will provide more meaningful work and stronger job security.